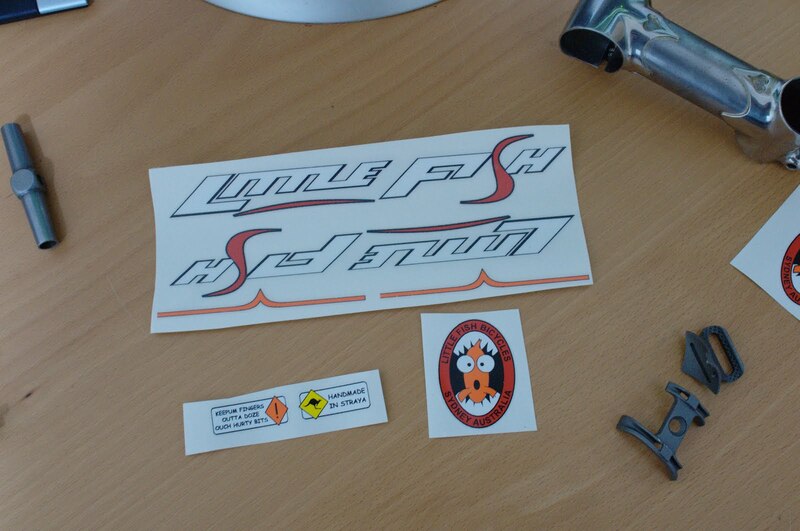 My first lot of decals have arrived, from Cyclomondo. I'm quite happy with them - the Gerber printer does quite a nice job. They aren't strictly speaking decals, but instead are printed vinyl stickers, similar to the Columbus etc ones. They're certainly thin enough to be hidden under clear coat. The hardest part was finding a file format that Greg could read reliably - the software I used to create the artwork (Inkscape) doesn't output the right files for the Gerber printer, so lots of experimentation was required. I ended up sending Greg .eps and .plt (hpgl) files, one of which he was able to work with. Greg removed some of the black outlining from the head badge - presumably to ensure that it printed well, as the outlining was pretty thin. I put it back with some fine 0.03mm Copic markers :) I confess I quite like hand drawing parts of my decals - fits in with the whole Richard Sachs "imperfection is perfection" thing, and allows me to release my inner artiste. I think I'll scale up the downtube decals a bit for the next go, as these ones look a little small even on Kristyn's titchy frame.